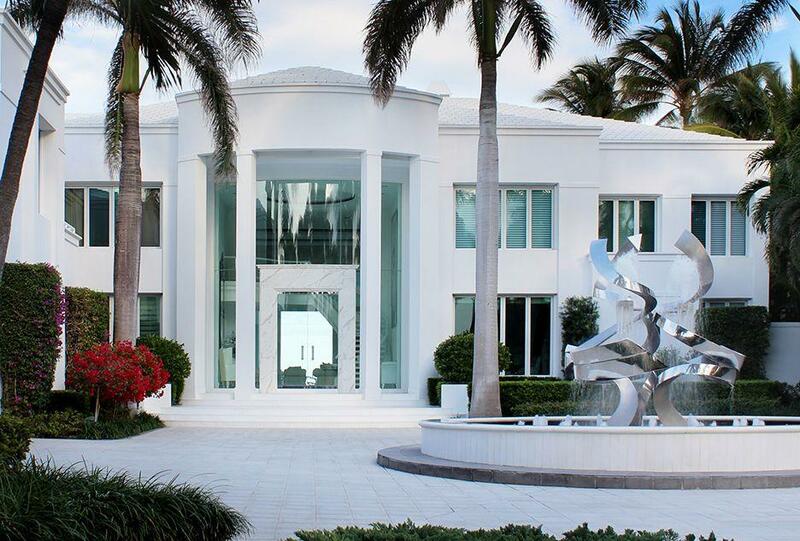 This contemporary mansion in Delray Beach Estates in Delray Beach has everything to offer. This six bedroom , nine full bathroom, and three bathroom home is laid out generously over twelve thousand square feet of perfectly appointed living space.This is a custom built home with Thassos marble floors throughout. The soaring twenty five foot ceilings are impressive. The glass walls are all floor to ceiling too to have panoramic views of the Atlantic Ocean. The downstairs master suitefeatures his and hers walk in wardrobes. The masater bath boasts marble bath, spa tub, steam shower, and a flat screen tv concealed behind a remote mirror. The six bedrooms do not include a seperate office, nursery, gym, and live in one bedroom one bathroom maid's quarters with a full kitchen. The meticulously landscaped backyard oasis has an elegant pool and spa. Just steps to your own pristine beach! Residents of Delray Beach Estates are in close proximity of fine dining, shopping, and night life with nearby, Atlantic Avenue, Mizner Park, and Boca Town Center. The Palm Beach International and Fort Lauderdale International Airports are a short drive.